Solah Shringar of a bride looks tasteless without that striking mehndi design. Amongst trillions of Indian rituals, mehndi is one such tradition which not only tickles the bride, but also the guests. Application of mehndi is not just restricted to weddings; women are seen smearing the henna too during karwa chauth, baby showers and teej. These are those auspicious times when the demand for top mehndi artists is at its peak. With social media platforms such as Instagram and Snapchat that let people reveal their life’s precious moments, professionally trained mehndi artists have become the preferred choice for weddings, as well as common celebrations for their unique and intricate henna styles that are worth showing off. Take a look at these top 10 mehndi artists in Mumbai, who can make your mehndi design look like magic! First on our list of top 10 mehndi artists in Mumbai is an award-winning artist who loves to explore new ideas when it’s about mehndi designs. She offers unique creations to her clients that strike the right cord with them. Whether it’s a normal henna art or an elaborate bridal mehndi design you’re after, Jyoti is your go-to person. Though second on our list, Geeta Patel tops the chart when it comes to universal mehndi artists based in Mumbai. What we mean by universal? Be it traditional, the famous Arabic, Indo-Arabic, floral or zardozi, Geeta Patel excels in all and how! She has been adapting to the evolving trends of mehndi designs since the last 20 years, and her work is the true example of her professionalism. From simple to the most intricate, complex mehndi designs, you can blindly trust Nirmala Ashtana to get a spectacular job done. Renowned as one of the top Mumbai-based mehndi artists, Nirmala has created beautiful religious themes and motifs for women’s hands and legs at festivals, family events, weddings and so on. With over a decade of expertise in the field of mehndi designs, Pawan Arts is ideal if you’re seeking affordable mehndi artists in Mumbai. In addition to the traditional design, specialised areas of Pawan Arts include Arabic and Moghul henna art. 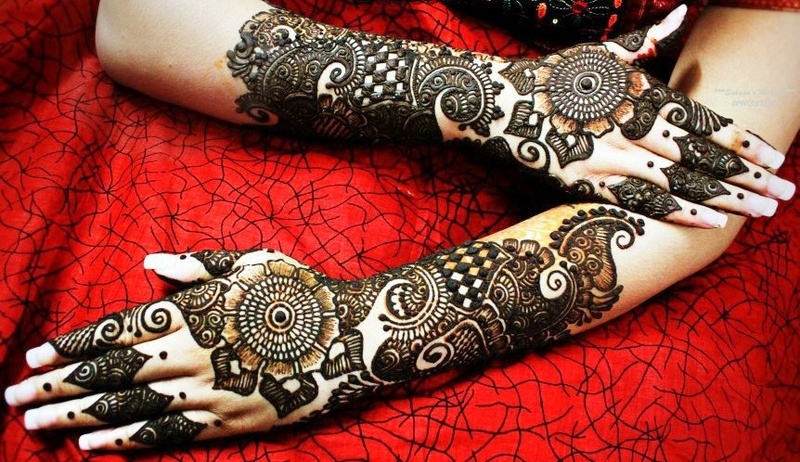 Do enquire about henna tattoos and cutwork mehndi designs as Pawan Arts specialises in them as well. What started as a fun pass time at family and friends’ parties and functions, today, Rahul Mehendi Arts has established themselves as one of the top bridal mehndi artists in the city. With the innate zeal of always offering something unique to the clients, Rahul Mehendi Arts is known for creating an amalgamation of contemporary and traditional designs. If you wish to show off some cool henna art, yet maintain its traditional essence, you know whom to call. This list would be incomplete without mentioning Deepa Sharma, who has been working for celebrities with her exquisite mehndi designs for over 26 years. Mehndi designing is in her genes, a skill that has been passed onto her from her mother who learned it from Deepa’s grandmother. This family of henna queens has worked for celebrities like Nargis, Aishwarya Rai, Genelia Deshmukh and Isha Koppikar, to name a few. If you’re the kind who loves surprises, then Hansa Gajra will leave no stone unturned to amaze you with her on-spot designs. Her craze for experimenting with traditional and trendy mehndi designs has pushed her onto the top mehndi artists list. Her unique creations are hard to find and will leave your guests spellbound once they look at you. Bridal, zardozi, sari pallu, jadau, kundan, bandhani and Arabic designs are some of her areas of specialisation. With over two decades of experience in henna artistry, Jayshree Maru is an award winning henna artist. Her dedication to henna artwork and fine detailing has helped her acquire several celebrity assignments. Her impressive mehndi designs have made her a celebrity favourite. On one side, we have Shobha and Ekta Kapoor ruling the television industry; likewise on the other side, we have Usha and Ekta Shah, who have made their mark in henna artistry. While Usha excels in traditional designs, Ekta’s dominance lies in contemporary henna art. The mother-daughter duo is famous in India, as well as internationally as they have worked with famous celebrities and high profile clients. Saving the best for the last in the list of top 10 mehndi artists in Mumbai, we have Bollywood henna queen, Veena Nagda. She has worked with a countless number of celebrities for weddings and movie projects. To name a few, Shilpa Shetty, Karisma Kapoor and the Ambanis are a part of her famous clientele. Veena Nagda is not just famous all over India; her work is highly regarded overseas as well. If you manage to get an appointment with her, it will be nothing less than sone pe suhaaga! Do approach these top mehndi artists to add a touch of style and glamour to your celebrations. Browse through our mehndi vendors list for their contact details.